On January 14, 1990, 4 Rotarians and their spouses, from two neighbouring clubs in District 5040, met informally to discuss the formation of a Gourmet Fellowship which would comprise of rotarians witha common love to try preparing dishes from various countries through trial and error and hopefully be able to survive such an adventure into the unknown. One week later the first dinner meeting of Richmond - Chapter 1 was held. 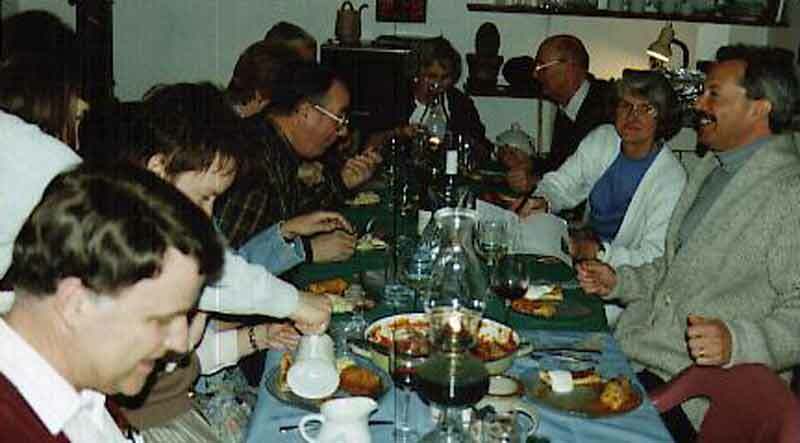 Left to Right: Denise and Larry Pretty, Marianne & Jack Campbell, Angie Vanderkooi, Derek & Johanna (hidden) Rundell, Joan (hidden) & Helge Nielsen, Helen & Al Wawryk, Madalena Corsi, Missing Otto Rieve and (photographer) Wilbur Walrond. A year later on April 3, 1991, with twenty members, from seven (7) Rotary Clubs in the District, the World Fellowship of Rotarian Gourmets was officially approved by Rotary International. On March 26, 1993, District boundaries were crossed when Chapter 2 was chartered in Penticton British Columbia, District 5060 (Penticton International Gourmet's - PIGs ). On September 15, 1996 Chapter 3 was formed in Nipawin, Saskatchewan. The WFRGs finally went International on January 31, 1997 with the formation of Chapter 5 in Everett, Washington U.S. followed by Chapter 6, on March 26, 1997 in Liurieton NSW, Australia. To date we have 7 Chapters in 6 Districts in 4 countries. For more information on our Chapters see Chapter News.